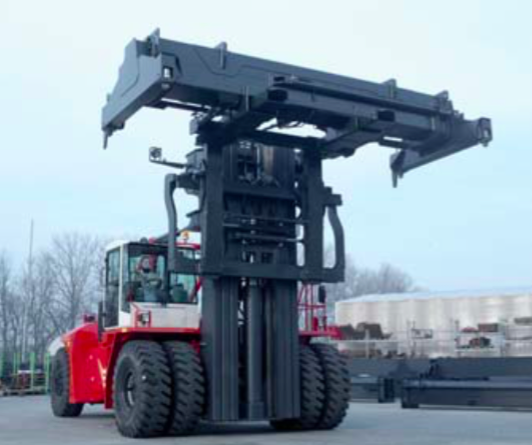 CVS FERRARI offers to its public a series of Loaded Container Handling “Liftrucks” that have no equal in the marketplace. Featuring functions that have never been seen before, these “Toploaders” are bringing new life to this product concept. The line of Laden Container Handling Lift Trucks is offered in two basic chassis and three main stacking versions, capable of lifting 4×9’6″, 5×9’6″ and 6×9’6″ high. A three stages “RoRo” application mast is available for up to 4×9’6″ high stacking for the short wheelbase chassis model of the range. The Toploaders feature the same high efficiency and fast response electro-hydraulics as the Reach Stackers, and the same powerful on-board computer system that supervises their operational safety, sub-system functionality and optimisation of use. Benefiting from the components standardisation with the heavy boom trucks, the CVS FERRARI masted laden container handlers are able to offer new and unique features never seen before. Among these is the Load Moment Indicator and Limiter. This safety device takes into consideration the effect of the mast told and of the spreader outreach on the static and dynamic stability of the machine. Based on that data it progressively prevents dangerous manoeuvres as the truck stability reserve is reducing. Another key and exclusive feature is the safety concerned Spreader Individual Twist-Lock Status Information which shows the driver if any of the twist-locks are not correctly seated or locked. Other new features include the “Stacking Height Indicator” and the “Driving Configuration Optimiser” which reduces tire wear and increases driving stability. Equipped with Variable Displacement Piston Pumps, this range of trucks is the most fuel efficient in its class and by far outscores in the economic value of operation versus the competitors’ models, which still adopt antiquated technology resulting in poor fuel efficiency and hydraulic oil polluting gear pumps that have a very limited service life. The pressurised oil tank and separated brake and hydraulic oil circuits/cooling system are just another exclusive feature that will lower the cost of ownership, reduce the downtime and extend the service life of these fantastic machineries. CVS FERRARI produces a complete range of Heavy Duty Fork Lift Trucks with capacities ranging from 18 to 48 ton. Standardisation of components and features with their world class Container Handling machines creates General Purpose Liftrucks in a class of their own. Many of the standard features would be options if available from other manufacturers. The trucks are designed with ease of access to the engine and transmission compartments and come with a caretakers’ beloved service bay compartment, grouping all the replaceable filters and fluid fillers in an easy reach side of the body lodged compartment. The spacious and luxurious ARIA cabin of the CVS FERRARI container handlers is also available for this product family. The CVS FERRARI range is offered with a wide choice of attachments for a multitude of heavy load handling needs. Special and purposely developed magnets and vacuum lifting attachments are also some of the many tools with which it is possible to dress these sturdy and reliable workhorses.